So this meme has inundated my feed lately. There is such a significant wave of apostasy in my former religion that I think these are kind of reactionary. In a moment I will explain why. 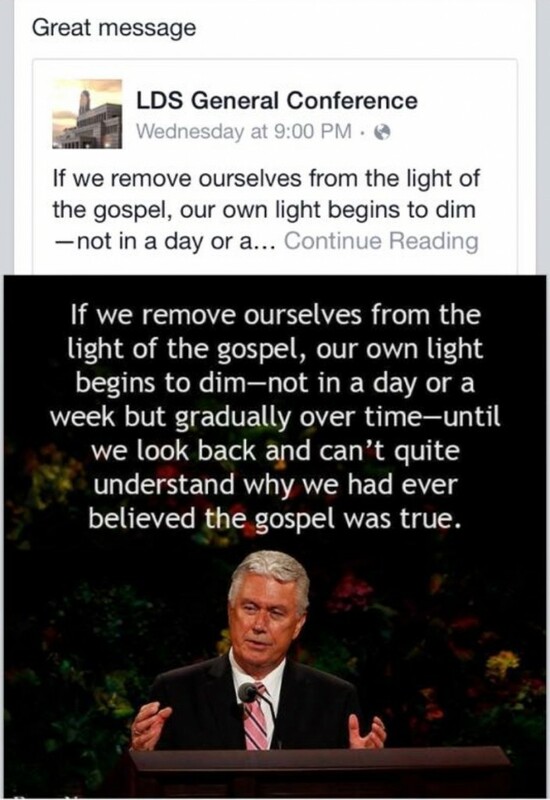 First, note how from even one of the most open and liberally minded apostles today the message is still subtly dismissive by stating the apostate loses the ‘light’ she once had. It is true however that after some time has passed that the non-believer often wonders how he had been so easily bamboozled. So while I completely disagree with the metaphor of lost light, the premise being taught here is well-known in psychology today. Consider this tidbit from Dr. Simon, a psychotherapist recognized internationally in dealing with victims of fraud and manipulation. Fact is most of us are familiar with the feeling of being defrauded by someone we have trusted. The deeper the trust was, the worse this feeling of being so dumb after it happened is. The large majority of people I know that have left the faith once they discovered the evidence of historical white washing and fraudulent beginnings where typically very invested. I now know bishops, elders quorum presidents, stake presidents, young women leaders and many others that have gone down this path of ‘lost light’ as Elder Uchtdorf calls it. 2 What all these people I have met have in common is they were very much committed to the faith. Very few were half-assed believers in the gospel. They typically inundated themselves in it, doing their best to serve and be part of the church. ‘Magnifying their callings’ as best they could. This is important to note, because repetition is a key component of coercive persuasion. Our brains are amazingly pliable (known as neuro plasticity) when it comes to acquiring skills. The same way we ‘learn’ to catch a ball, we learn social responses and methods of thinking. We engrain the new pattern in our mind via repetition. This fact is exploited by con-men and cults alike. You instigate a loop of thought that the leaders can’t be questioned, that certain rituals must be maintained, even specific clothes worn. After some time, all that feels normal to you.3 I am positive these ladies felt pastels were just the way a pretty, virtuous woman dressed. Look how happy and smiling they are! They might even have reminded themselves how much they love the FLDS faith and their leader prophet Jeffs as they put them on each day. Once all that ‘feels’ normal to set it aside at first ‘feels’ completely wrong. Now if your leader was really smart he made sure to teach you that that wrong feeling was ‘of the devil’ and a sign you were straying from the path and losing the light. If you internalize that idea, then you are trapped. Because there is no way out beyond that point that doesn’t require you to risk massive losses in your own mind. You fear losing family, social status, you even fear for your job and possibly your sanity the moment you try to think outside that circular logic. 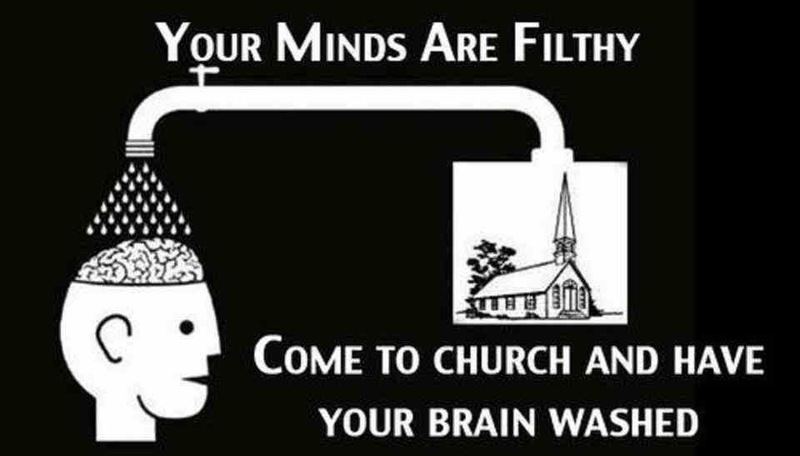 The people that I know that have left the church were first and foremost digging for truth. They had to set aside all these fears of condemnation in search of it though. They had to stop running in the loop of self-justification and consider the most disturbing possibility that they might be wrong. Ironically it took a far greater level of humility to question the religion than it took to not question it. Our natural psychological response is to protect that deeply held belief and surround ourselves with anything we can find that will support it. It’s why you see a Muslim pray harder, or a Catholic counting rosaries when their faith is challenged. These days a person seeks out memes and posts them to their wall as an open declaration of their beliefs. And guess what, that psychology works. The more you openly declare something the more you believe it. But that alone doesn’t make it true now does it? Then take a chance, stop inundating yourself every single day with the prescribed clothing or the ritual ceremonies and observances you have been told to do lest you lose the faith. Stop for just a moment, because the Elder is right. 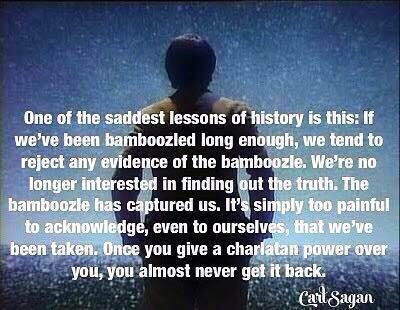 The only way to see how you have been bamboozled is to first stop the actions that keep the bamboozle going. His metaphor is wrong though and I know it personally. Because once you are willing to question the status quo and to think about the way you think. You don’t lose the light of truth. You find it. This resonated deeply with me. 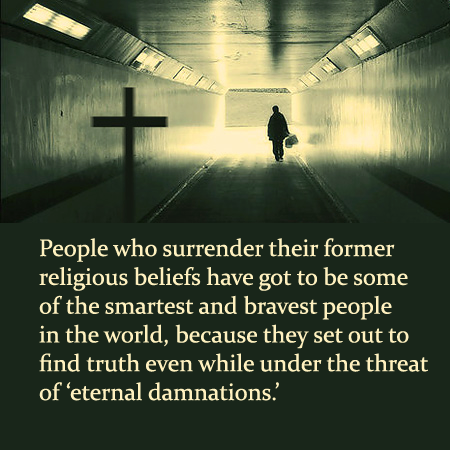 What a scientist really wants is to be proven wrong with powerful evidence (because that would represent a great step forward) but what a religious person really wants is to NOT be proven wrong with powerful evidence (because that means being wrong) — which is more humble? Observing good, nice members having no empathy for THIS particular 14 year old bride – it’s what broke it all apart for me. Awesome. Describes my experience well. Great article, and a nice reminder for when I start feeling that it’s too hard to break out of old patterns.